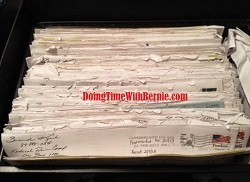 DoingTimeWithBernie.com: Felon Bernard Kerik disappointed with AG Eric Holder's US JusticeDepartment, ya think? Felon Bernard Kerik disappointed with AG Eric Holder's US JusticeDepartment, ya think? Felon Bernard Kerik is "disappointed" with AG Eric Holder's US Justice Department. Ya think? Most felons serving probation may agree! Today, on NewsMax.com TV, felon on probation Bernard Kerik was asked his comments about exiting Attorney General Eric Holder and whether Kerik considered Holder a "political grievance monger"! To this, Bernard Kerik confessed he was "disappointed" with the entire US Justice Department! Yup. This year felon on probation Bernard Kerik was denied early release from his criminal probation. Bernard Kerik reportedly owes the USA over $187,000 in criminal restitution on which he pays a mere $250.00 per month. Yes, I would think "disappointment" may be a relevant as it is reciprocal in a conversation about felon Bernard Kerik v USA. God Bless America.